Pack size: 3 x 250ml bottles & 3 contact lens cases. CooperVision’s Refine One Step, is the new name for Sauflon Multi, an all in one lens solution designed to clean all kinds of lenses. To use, simply place your contact lenses inside their anti-bacterial case and completely fill it with Refine One Step, making sure they are completely submerged. Leave them overnight, and in the morning you won’t even need to rub or rinse your lenses to ensure they stay fresh and clean throughout the day. Refine One Step gets to work right away, quickly removing any harmful bacteria or protein deposits that may have built up on the lens. However, despite offering a powerful clean, you won’t find any preservatives in this peroxide-based solution. Even the most sensitive eyes won’t be affected by Refine One Step, making it perfect for those prone to dry or irritated eyes. 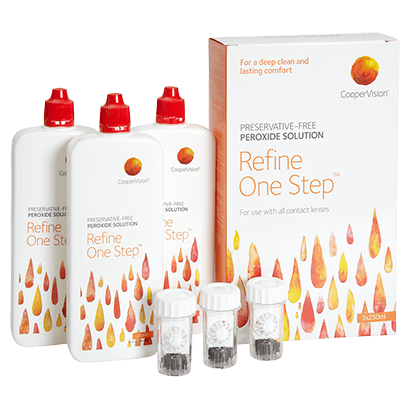 Refine One Step is available now from Vision Direct. Check with your optician to see if you could benefit by switching your solution.